Click. Pray. 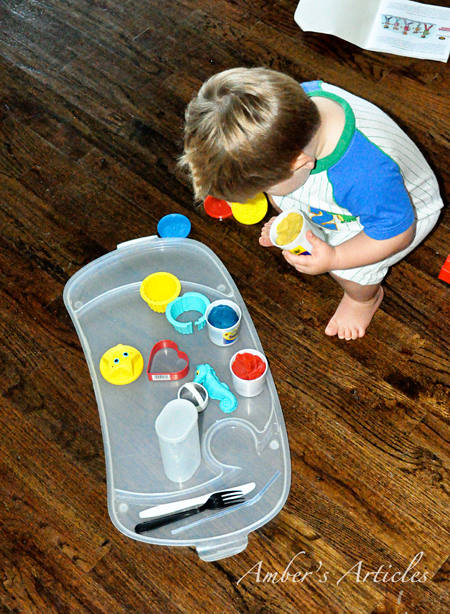 Love: Pre-Toddler (12-18 months) Activity #5: What to do with Play-Doh? 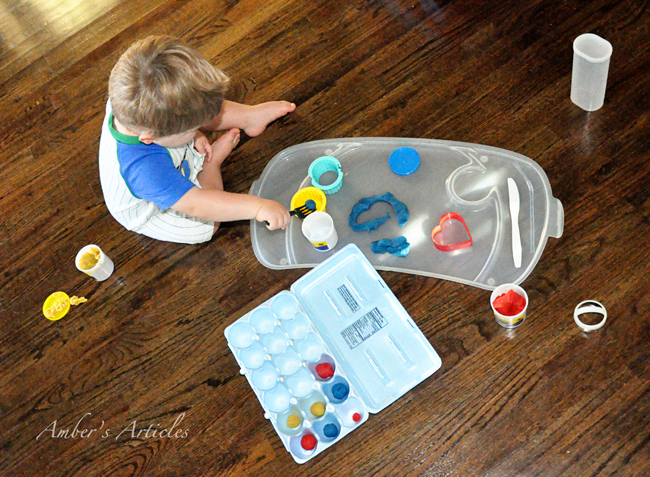 Pre-Toddler (12-18 months) Activity #5: What to do with Play-Doh? The age appropriateness for Play-Doh varies greatly depending on who you talk to, but my 16 month old LOVES it!! A child's level of understanding pretend play and more complex verbal commands increases. Would I have tried Play-Doh play with my 12 or 13 month old (and even 14 month old).........probably not. At 12 and 13 months, pots, pans, spoons, raisins, cheerios, and such are more appropriate for their developmental stage. Plus, they have a heavy oral fixation at this age. 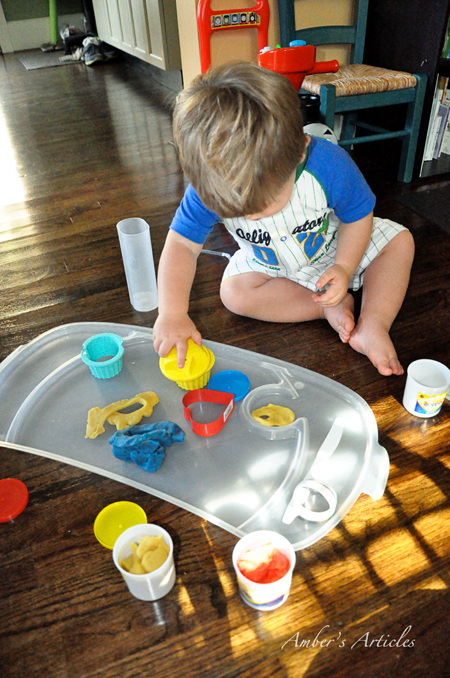 Don't expect a 15 to 18 month old to play independently with Play-Doh unless they have experienced it previously. Provide a few utensils to play with, always demonstrating what to do with each one. Example: I use a plastic knife to show him how to cut the Play-Doh. Provide containers to play with. He likes to place the balls back inside the containers. I provide a Bundt or tube pan. He likes to fill the center up with Play-Doh balls. Demonstrate: how to roll the Play-Doh balls, how to tear the Play-Doh apart, how to wrap it around your wrist to make a bracelet, how to count the balls, etc. The possibilities are endless if you just use your imagination. 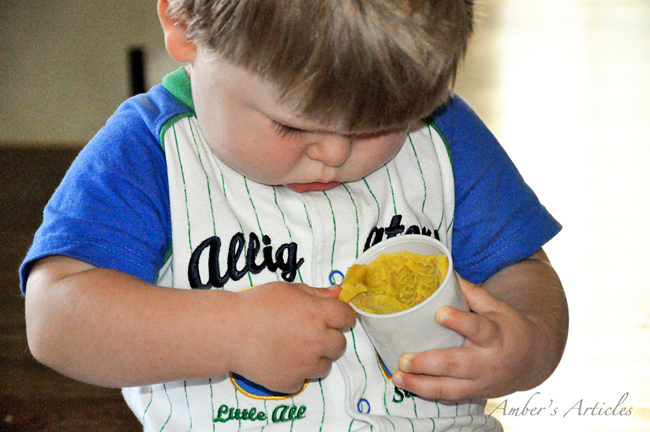 Do you use Play-Doh with your Pre-Toddler? What other ideas do you have to make Play-Doh age appropriate? 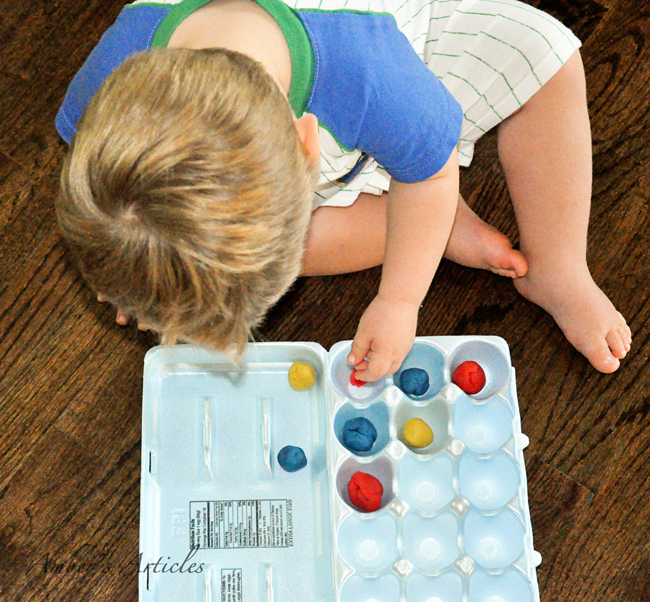 Pre-Toddler Activity Tip #2: Children love to explore. The more opportunities you give them, the more they will discover and discovery is the catalyst of learning. 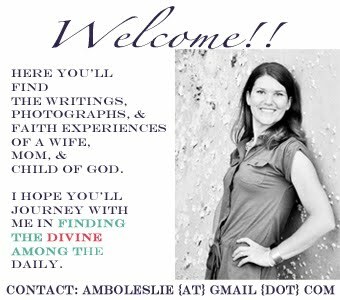 Great posts about development Amber! I make my own play-dough. My son's five now but he loves helping with measuring. 200g flour, 100g salt, 2 tsp cream of tartar, 1 tbs vegetable oil, 300 ml water, then you cook it over a low heat until it's stiff, then knead and add food colouring. You can add it with the other ingredients if you want it all the same colour. I never had a problem with him eating it, it's very salty so I think it's off putting. It's a bit softer too so probably easier for a little child they can really squish it. great ideas! the creativity with just play doh too! There's also a way to make homemade edible finger paints with pudding, if you ever want to do a super-messy but fun activity. It's best to go ahead and strip him down to a diaper first and lay out a shower curtain or something similar on the floor first. I've only EVER let little kids fingerpaint outdoors for the most part... it's way easier to hose them off that way, and then it's still fun for you because you won't be stressing about the mess. My kids LOVE playdough. These are all fantastic ideas! Cute! You have a smarty on your hands.